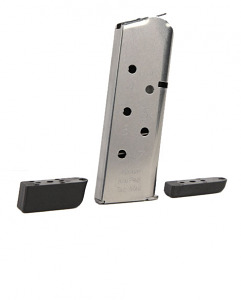 Manufactured from high grade stainless steel, these Kimber KimPro Tac-Mag 7 round .45ACP 1911 magazines will fit your Compact Model 1911 platform pistols. The Kimber KimPro Tac-Mag feature a removable base with three choices for base thickness. You can use the flat matel base plate or choose one of the polymer bumper pads. The mag works great. Fast service , I would purchase from you again.